Core De Force Power Sculpt Review! Power Sculpt is one of two strength training workouts in Core De Force – the mixed martial arts program developed by Beachbody. It contains more cardio moves than Dynamic Strength, so you really get your heart rate up throughout the workout. Description: A total-body burner designed to sculpt lean muscle and build next-level endurance with explosive power and interval training. Format: There are 9 rounds. With all Core De Force workouts, a “round” is 3 minutes long, like a boxing round. However, unlike the workouts that start with “MMA,” the format for a round is a little different for Power Sculpt, as it is more similar to the format of Dynamic Strength. There are three moves in each round – the first move is considered to be the easiest and performed for 1 minute; the second move is a little more difficult and performed for 45 seconds; and the final move is considered to be the hardest and performed for only 30 seconds. You will typically see one variation of a push-up, one leg move, and one move that focuses on the core and/or balance. There are 4 original rounds; after you do them, you start from the top. There is a final 9th burnout round with no breaks. Warm Up: A short warm-up of the following moves: pulse side-to-side with a chest opener, pulse side-to-side with shoulder rolls, jumping jacks, alternating windmills to warm up the hamstrings, hip rolls, and a torso rotation. 1. Hip Drive Throughs. I need to do a video to describe this one sometime. Basically, you start in a seated position, then roll onto your back, raising your legs and hips into the sky, then rolling forward into a kneeling fight stance. This one’s fun, and a great first move to get the blood flowing! 2. Jumping Firefly. Crouching push-ups with an oblique knee. ROUGH! 3. Half Monkey to Guard. These are similar to gorilla crawls from 22-Minute Hard Corps, but a little easier, as you’re only doing one rep from side to side, and you stay a little higher in the squat. 3. Low Stance Switch. Start in a squat position. Jump your feet so that you’re twisting through your core, and one foot alternates being slightly forward. Return to squat position. Alternate. 1. Ginga Hop. Ginga lunge, then jump laterally into a lunge on the other side. 3. Triple Alligator Push-ups. This one is strength and cardio combined! Start in a low spider lunge, do three push-ups, then do a plyometric switch to change positions. Brutal! 1. Roll Jumps. Roll back, jump; roll front, jump. Easy? Jump higher! 2. Plank Skaters. Start in a bear stance. Move your right leg over your left so that it’s diagonally behind your body. Return to bear stance. Switch sides. I like to add a hop in between to make it a little harder. 1. Reverse Lunge, Clinch Knees. Basically lunges with alternating knees. 30 seconds on each side. Jericho modifies the move to make it more difficult by adding a hop with the clinch knee. 2. Push-up, Leg Check. Push-up with an alternating leg check. One minute. OMG. Cooldown: There’s a short cooldown (around 2 minutes) with the following moves: Hip flexor to calf stretch with a shoulder stretch, quad stretch, hamstring stretch, upper back stretch, chest opener stretch. The verdict? This is one of two strength training exercises from the program, and it’s definitely a bit harder than Dynamic Strength. The bursts of cardio between some of the lower impact strength moves keeps your heart rate up throughout the duration of the workout. A lot of the moves in this workout are just, quite simply, FUN. The hip drive throughs, for example, just make me feel like I’m a kid rolling around! Interested in Core De Force? You have a couple of options to buy it. You can get a challenge pack that comes with Shakeology, or a performance pack that comes with two of my favorite performance supplements – Energize and Recover. You can also check out the base kit or deluxe kit. Need support? It just so happens that I coach people through at-home fitness programs, like Core De Force! So, if you order the program through one of the links on this site, I’ll be happy to work with you to help you stay on track and plug you into one of my online accountability groups! Have questions? Comment below or send me an email at distilledjill@gmail.com! How many different ways can you do a push-up? This workout answers that question! Description: Low on impact but high on intensity, this no-equipment, bodyweight throwdown is designed to carve impressive definition. 1. Inchworm Push-ups. Here’s a short video of this move from the progression in Round 7, where you add a leg lift on each push-up. During Round 1, there is no leg lift. 2. Bridge Reachover. This move is inspired by Brazilian jiu-jitsu. Here’s a short video of the Round 7 move with a progression where you lift your heels off of the ground. During Round 1, your heels stay on the ground. 3. Single Leg Balance with a Kick (right side). Another short video to show you this move. There’s not really a progression in Round 7, though you can focus on kicking higher. 1. Scissor Push-ups. This move is rough! It’s also in Insanity Max: 30, which is my favorite at-home fitness program by the way. Starting in push-up position, bring one leg under your body so that your foot is on the opposite side. The progression is Round 8 is actually floating your leg off of the ground, rather than having it rest on the floor. 2. Sumo Squat with a Leg Check. Squat, then at the top of the squat alternate raising one leg for an oblique crunch. There’s no progression on Round 8; just try to get deeper into the squat. 3. Single Leg Balance with a Kick (left side). Same move as Round 1, just on the opposite leg. 1. Walking Split Push-up. I’m weird. This is my favorite move from this workout. Here’s a short video to show you this one, which include the Round 9 progression, where you raise a leg. During Round 3, both feet stay on the floor. 2. Circle Sit Uppercut. Starting your back, do a sit-up with an uppercut at the top. For the Round 9 progression, you add a hook. 3. Balance Repeating Side Kick, Tap Down (right side). This is a fairly slow side kick that gives you the chance to focus on your form and engage your core. In the Round 9 progression, don’t tap your foot on the floor. It’s a real balance challenge! 1. Push-up to Knee Escape. A push-up with an alternating knee tap. In the Round 10 progression, as shown in the video, you instead tap your toe. 2. Floating Starfish. Lay on your belly with your arms in front of you. Raise your arms and legs off of the floor and alternate raising your right arm with your left leg and vice versa. In the Round 10 progression, keep all limbs off the floor, while raising and lowering them all at the same time. 3. Balanced Repeating Side Kick, Tap Down (left side). Same as Round 6 move, but on the other leg. 1. Triple Wide Push-ups. There are three brutal push-ups in this move: a tricep push, them walk your hands out to a regular push-up, then walk them out to a wide push-up. There’s no Round 11 progression, but the challenge is to stay on your toes in both rounds! 2. Left Reverse Lunge with a Twist. Start in a lunge, then at the top of the lunge, raise your leg and twist through your core. There’s no Round 11 progression. 3. Alternating Side Plank. Start in a forearm plank, rotate into a side plank, and punch your arm into the sky. For the Round 11 progression, in addition to raising one arm, you raise your leg as well. 1. Sphinx Blasters. This is the hardest move in this workout… and maybe even the entire Core De Force program! Here’s a short video of me doing this on my knees. In Round 12, try to do a couple on your toes! 2. Right Reverse Lunge with a Twist. Same move as Round 5, but on the opposite leg. 3. Sit-up Escape. Great ground fighting move! Start on your back with your front leg straight and your back leg bent with your knee to the sky. With your hands in guard, do a sit-up, then transition into a bear stance, then switch sides for the sit-up. There’s no Round 12 progression, but I like to try to do a hop in between sides. Cooldown: Staying on the floor, drop your knees to one side for a torso twist, followed by a hamstring stretch on your back with ankle rotations. Roll up into a seated position. The cooldown ends with a shoulder stretch, tricep stretch, and a chest opener stretch. The verdict? Other than the Active Recovery workout, this is probably the easiest of the Core De Force workouts, despite the numerous push-ups, though several of the moves are still pretty challenging! It’s low-impact, but I definitely worked up a sweat! Day 1 of Core De Force! I am an at-home fitness junkie. I lost 60 pounds without EVER stepping foot in a gym thanks to a variety of at-home fitness programs that I can do in the small living room of my condo in the city, practicing clean eating, and drinking Shakeology. But before Insanity, the 21-Day Fix, and PiYo, I was doing Tae Bo. I begged my mom to buy it for me in high school, and it was my very FIRST at-home fitness program that got me hooked on exercising at home. So, when I heard that Beachbody – the creators of things like P90X, Body Beast, and Focus T25 – were coming out with a mixed martial arts program, I was ecstatic! It’s called Core De Force, which it is so named because it is actually designed to work my #1 trouble area – the core. So happy when Core De Force arrived in the mail! According to Beachbody, each move, whether it’s a jab, a kick, or an uppercut, works your core from every angle. The trainers and co-creators of Core De Force – Joel Freeman and Jericho McMatthews – call this 360-Degree Core Training, and I hear it’s more effective than traditional abdominal training to help you tighten up your entire midsection and carve a more defined waist. Sounds like exactly like what I need! Core de Force is a 30-day program, and it came with 8 different workouts on 3 DVDs that alternate Boxing, Kickboxing, and Muay Thai combinations, cardio spikes, and bodyweight training. These’s also an Active Recovery workout for your rest day and a 5-minute relief workout full of stretches to help you prepare for the following day. You don’t need any equipment for the program either, which is also appealing. Perfect if you have to travel for the holidays or life in general. The program also comes with a nutrition plan that uses the portion fix containers of the 21-Day Fix program, but I opted not to follow the nutrition plan. I found my groove drinking Shakeology and being a clean-eating vegan Mondays through Fridays with decadent cheat meals on the weekends. So, right now, I’m generally happy with where I am, and I’m in maintenance mode. Anyway, enough background. Let’s talk about my experience with Day 1. Day 1 includes one workout – MMA Speed. Description: Upper body- and core-focused, this Boxing-influenced workout is short – but packs a serious punch. Learn It: The first things I notice about this workout is that you are given the option to select either to do the workout or something called “Learn It & Work It,” which is 7 minutes long. 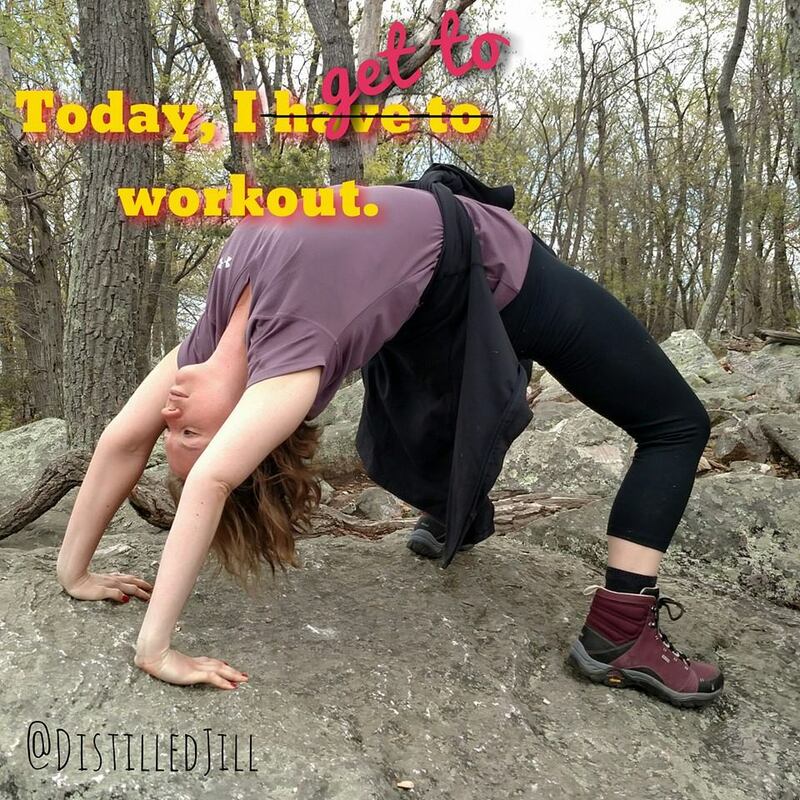 I opted not to learn it and work it because I’ve done both Tae Bo, Les Mills Combat, and some self defense in the past, so I had a feeling I could catch on quickly. Plus, I’m short on time in the mornings, so the less I have to do, the better! For the less coordinated, or people who are unfamiliar with basic MMA moves (like uppercuts and hooks), then I’d recommend starting with Learn It & Work It before jumping into MMA Speed. Music: Second thing I notice is that I am given the option to play the music that comes with the program or turn it off. I normally listen to the music that comes with the program the first time I do it, and then if it’s generic music, I’ll opt to play my own workout playlist in the future. Warm Up: A short warm-up of the following moves: jog in place, pulse side-to-side with a chest opener, pulse side-to-side with shoulder rolls, alternating toe taps to warm up the hamstrings, hip openers, and a torso rotation. Round 2: Rear knee, switch knee for 1 minute, with a 30-second cardio spike of up/down jab cross; repeat. Round 3: Cross, hook, rear knee, switch knee for 1 minute, with a 30-second cardio spike of up/down hooks; repeat. Round 4: Front uppercut, rear uppercut, hook, roll front, roll back for 1 minute, with a 30-second cardio spike of rotating uppercuts; repeat. Round 5: Cross, hook, rear knee, double jab, cross for 1 minute, with a 30-second cardio spike of roll jumps. Roll jumps always manage to get my heart rate up! Round 6: Rear uppercut, hook, cross, switch knee for 1 minute, with a 30-second cardio spike of ground-to-fighter stance. Ground-to-fighter stance is one of my favorite cardio spikes! You get knocked down? Get yourself up! Cooldown: A short cooldown of the following moves: hip flexor stretch, calf stretch with a shoulder stretch, quad stretch, hamstring stretch, upper back stretch, and a chest opener stretch. The verdict? Day 1 has me HOOKED (no pun intended). I love that this workout not only works the body, but the mind too. It doesn’t feel like it’s choreographed, like Cize or Les Mills Combat does, but, similarly, you are learning some combinations, which requires some muscle memory, coordination, and agility. I workout first thing in the morning, when my brain isn’t totally awake yet, so I feel like this workout helps me wake up my brain in addition to my body. The workout also includes one person who is modifying the workout, so if you need to decrease the range of motion or take out some of the high impact for your joints, you can follow the modifier and still get a great workout. Challenge 1 / Week 1: The Reset at work. Challenge 2 / Week 1: The Reset at a conference. Challenge 3 / Week 2: The Reset at a retirement dinner. Challenge 4 / Week 2: The Reset at a 24-hour Oscar-nominated best pictures marathon (in a movie theater). Challenge 5 / Week 3: The Reset during mourning and a funeral service. Day 2 of the Reset was my first day taking the Reset to my 9-to-5 job. The experience was surprisingly easy, though the preparation the night before was a little trying. I am going to be preparing my lunches the night before, and as much of breakfast the night before as possible. I hate mornings (which is something I hope will improve during the Reset), and really don’t want to set my alarm any earlier that I already do, so I’m trying to do as much prep work the night before as possible. You are only supposed to drink distilled water (mineralize supplement added) throughout the Ultimate Reset. I normally keep a Brita in my office, but since that doesn’t suffice, I was on the hunt for a jug of distilled water to bring into work to keep in my office to drink throughout the day. Luckily, a CVS drug store is right across the street from my office building, and they carry gallon jugs of distilled water (unlike my local Whole Foods)! I will probably be stopping into CVS each morning to grab my water for the day. As you may have read in an earlier post, due to technical difficulties associated with day 1, I had to switch the recipes for days 2 and 3. No big deal. On the Reset, you can swap meals throughout the program so long as they are the same type of meals (e.g., swapping a day 1 breakfast for a day 2 breakfast) and in the same week. So, on my day 2, I had the same breakfast as day 1 (2 scrambled eggs, steamed spinach, and toast – pictured in the “Day 1” post). My lunch was a lentil-lime salad, which was easy to prepare; the rest of the microgreens salad from day 1 with toasted pumpkins seeds; and a dressing of choice. I chose to make a batch of the Creamy Garlic Dressing to use for salads. It is really good. Next time I make it, though, I might add a couple of extra cloves of garlic because I can never get enough garlic. My day 2 dinner was comprised of nori rolls with tempeh and veggies; a Japanese cucumber salad; and miso soup. Notes on Dinner: The nori rolls with tempeh and veggies are essentially sushi. You are rolling your own sushi minus the raw fish. Luckily, I’ve taken a sushi-rolling class before, so this was not a big deal for me, but for folks who have never rolled sushi before, I suggest watching a Youtube video on how to roll sushi before attempting this. The nori rolls were excellent. I had actually never had tempeh before (that I know of) let alone smokey tempeh. I think smokey tempeh is supposed to be a vegetarian substitute for bacon. And while I think that comparison is a bit of a stretch, the smokey tempeh was surprisingly delicious. Though my sushi rolls did not turn out pretty (notice I’ve taken no picture of them! ), the meal was really good, and I look forward to having them for lunch today. I will try to roll them better today so they can be photographed. I loved the Japanese cucumber salad recipe, and the miso soup is solid. Day 3 was my second challenge throughout the Reset: The Reset at a conference. This day, I attended a conference at a Ritz Carlton Hotel for work. It started at 8 a.m., and we weren’t scheduled to have lunch until 12:45 p.m. — a pretty long interval. Before I left home for the conference, I had my breakfast, which was pretty easy to make in a time pinch in the morning. Breakfast was oatmeal with blueberries, and plain organic yogurt. The recipe book called for the yogurt to be sweetened with either pure maple syrup or stevia, but seeing the price of maple syrup, which I would only use sparingly throughout the program and don’t really otherwise use in my non-Reset life, I opted only to purchase raw agave nectar to sweeten things. I don’t know if I’ve ever had agave nectar before (outside of a cocktail), and I really liked it! Better than honey, actually, and I think I will keep using this for my few-and-far-between sweetening needs post-Reset (as I’ve mentioned before, I don’t have much of a sweet tooth). The night before the conference, I prepared lunch – a Greek salad with chicken and pine nuts. At the conference, while everyone enjoying a nice fancy Ritz luncheon, I ate my Greek salad in the hotel lobby bar. I got to do some work during lunch, so that was fine. Since this was Friday night, and I normally stay up much later on the weekends than I do during the week, I really spread my meals out throughout the day. Breakfast was around 7 a.m., lunch wasn’t until 1 p.m. (due to the conference schedule), I had my afternoon supplements (i.e., alkalinize and mineralize) around 5:30 p.m., had a snack of 1 cup of shelled edamame around 6 p.m., and the dinner was around 9 p.m.
Dinner was a southwestern veggie taco. So far, this was the quickest, easiest dinner I have made on the Reset. Many of the other dinners comprise several dishes (soup, salad, sushi). This was just one thing – a taco. A Note on Portions: The portions throughout the Reset (week 1 at least) have been out of control. I have been following the recipe guide’s portions, and some of the meals are just huge. 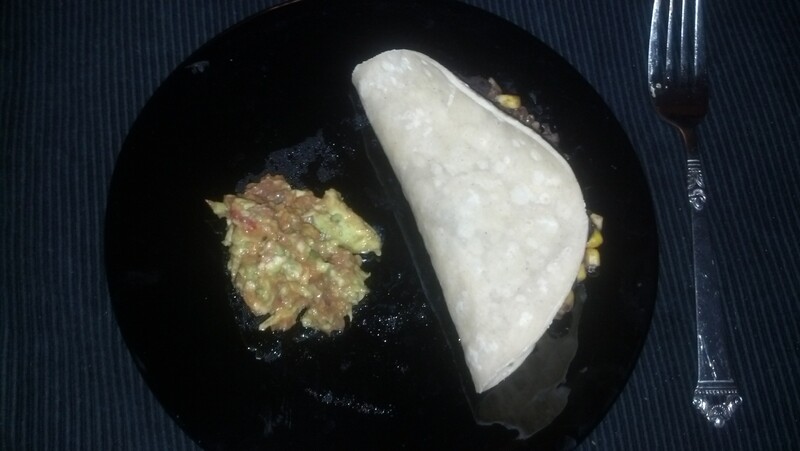 The southwestern veggie taco was huge. You are instructed to only use one 6-inch corn tortilla (think: small), and then proceed to stuff this solitary 6-inch corn tortilla with 1 1/4 cup black beans and brown rice and 1/4 cup of corn kernels. Impossible. I’m not complaining, though. I had plenty of the mixture of black beans, brown rice, and corn on the side, which made me very happy to eat after I devoured the taco. I took a picture of this one, which I understand does not look very appetizing, but believe me, it was good! Keep in mind all of the extra black beans, brown rice, and corn mixture is not pictured, so there is a lot more food in this meal that you see here. Results may vary. Exercise and proper diet are necessary to achieve and maintain weight loss and muscle definition. Consult your physician and follow all safety instructions before beginning any exercise program or using any supplement or meal replacement product. The information here is not intended to diagnose any medical condition or to replace the advice of a healthcare professional. If you experience any pain or difficulty with exercises or diet, stop and consult your healthcare provider.